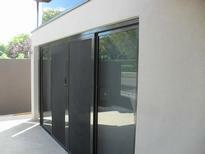 Invisigard Stainless Steel Security Screens are the premium security screen on the market today. Designed to contain the black 316SS screening using a complete encapsulating gasket, without any through fixings, meaning ongoing maintenance or corrosion issues are absolutely minimised in comparison to any alternative system. These can be fitted as an integral component to any opening/ventilation based product we produce in either the Commercial or Semi Commercial systems, or they can be installed as 'stand-alone' fixed screens for alfresco/pool area applications. Unlike many in the industry, we have our own 'licence' for this product and fabricate our screens 'in house' to ensure that our finished quality remains consistent.